I decided to create a place on the web where I can put the details of all of my adventures. A good percentage of those adventures focus around making things, whether food, drink or other items. I’ve been taking things apart to see how they work since I was a toddler and could get my hands on everything. I started to invent my first edibles when I could reach the counter using a stepstool and I’ve been sewing since I could hold a needle. In some regards I haven’t progressed much further than my pudgy little hands would allow at age 5, but I still find it enjoyable to see how things go together and where things come from. I live in a large house that I own with my friends, Tim, Caitrin and Whitney. In addition to the four of us, there are 3 cats, Liadan, Darcy and Kiki, whom I’m sure there will be plenty of photographic evidence of as they tend to like to participate in everything we do. We also have five chickens named Hoppy, Malty, Stout, Porter and Big Bird. Big Bird’s the white one on my shoulder in that picture above. She’s an easter egger who lays white eggs and has a huge personality. 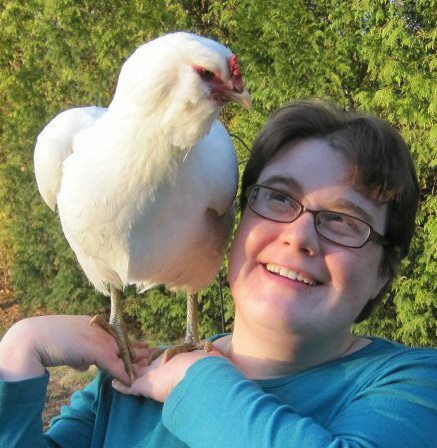 She got her name from her chick days when she was bright yellow and a head taller than the rest of the chickens. We renamed her Lager to fit with the theme, but it’s never caught on. We also have a resident Bearded Dragon named Porthos who enjoys flinging himself into danger and begging for crickets. In our little 1/2 acre lot we also have a small garden that has been mostly surviving the weird weather we got this summer and enough open space for periodic SCA/LARP fight practices in the back yard. Neither of which I tend to participate in, but it makes for an interesting background, and scares away the marauding squirrels and bunny rabbits. When I am not at home creating things, I’m generally at work, creatively solving problems, often using the scientific method to track down things we missed in a web product my company publishes. If I’m not at work or at home, I enjoy kayaking, geocaching, hiking (though I’m terrified of ticks) riding my bike on the rail trails, swimming in a local pond, snowshoeing, and maybe if I can get someone to go with me, cross country skiing. I also enjoy visiting cities and museums, soaking in as much life as I can. I’m a dabbler. I am an expert at nothing (though I do probably know more about making fake blood and viscera than anyone else you know) and I like to explore new and old techniques, refining them until I have learned enough to make the experiment repeatable at will. Mostly I start projects, sometimes I finish them. One of my on going goals is to finish more! So as you can see, this blog will have a broad sweep across many different spectrums and projects, but I welcome you to come along and join in on the journeys.